On the most recent episode of “Skywalking Through Neverland”, I had the pleasure of sitting down with the host and hostess of the show to discuss the recent book, “Star Wars Catalyst: A Rogue One Story”. It was a great opportunity, as it usually is, to discuss a recent Star Wars novel (it was my ninth podcast appearance on “Skywalking Through Neverland”). 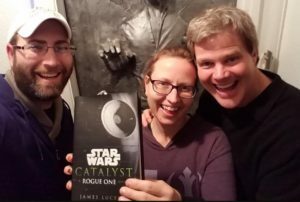 In this case, “Star Wars Catalyst: A Rogue One Story” (henceforth, “Catalyst”) was an interesting book to discuss, since it ties in to the recent movie, “Rogue One, A Star Wars Story”. While many people have seen the movie, many people have no plans of reading “Catalyst”, which is where we hope to fill people in. That is where our conversation comes in. Our conversation, which takes place from 1:04:28 until 1:34:53 in the audio below (or by downloading their podcast (e.g. through iTunes)) is not as much of a review as it is a discussion about key characters both in the book and how they relate to “Rogue One”. The book helps especially in getting a sense of what is going on in the pre-title sequence, which takes place four years after where the book leaves off (and the post-title sequences take place 17 years after where the book leaves off).